Portals and Gates offers the first comprehensive overview of Albert Paley's public, private, and institutional passageways and also highlights key works - both built and imagined - in his long career. 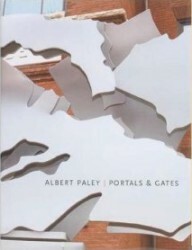 This book presents the finest examples of Paley's distinctive interpretation of gates, portals, and passageways. Commissioned by both public institutions and private corporations, he has completed more than 50 site-specific works. Albert Paley (b. 1944), modernist American metal sculptor, is the first to receive the coveted Lifetime Achievement Award from the American Institute of Architects - it's highest award to a non-architect. Paley has been active as an artist for over 30 years. Commissioned by both public institutions and private corporations, he has completed more than 50 site-specific works. Notable examples are the Portal Gates, Renwick Gallery of the Smithsonian Institution; Synergy, a ceremonial archway in Philadelphia; Portal Gates for the New York State Senate; and a plaza sculpture for AT & T in Atlanta. Paley's work can be found in the permanent collections of many major museums including the Victoria and Albert Museum, and the Fitzwilliam Museum, Cambridge.